Nordic Publishing in conjunction with Industry and recycling organisations – Georange, El-Kretsen, ÅI and EÅF are proud to invite you to "Future Circular Materials Conference" – at the Grand Hotel in Stockholm Sweden on September 23-24, 2014. 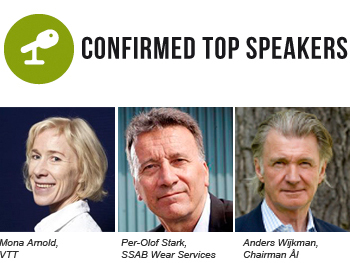 Future Circular Materials Conference will bring together major decision-makers from the basic and recycling industries as well as academics, researchers politicians- stakeholders from the Nordic region to one location.The purpose of the conference is to connect the entire supply chain- extraction, design, recycling, and resource recovery. Future Circular Materials Conference allows the visitors to network throughout the supply chain and discover forward thinking solutions for closed loop business strategies. SSAB is a global leader in value added, high strength steel. SSAB’s facility in Oxelösund, situated 100 km South of Stockholm, is the heart of the production of Hardox, the world’s leading abrasion resistant plate. Visit Svensk FreonÅtervinning (Freon Recycling) in Hässelby outside Stockholm. Promote your company to the major decision makers in the different sectors of Materials Recycling.